It is pretty quiet in the garden with only three chickens which is both good and bad. I love planting but the chickens sadly doesn’t see the difference between weeds and flowers… But as sure as I’ve already ordered new seeds I’ve started looking for eggs to buy. I am really happy with Hedemora and whatever mix race the new hens are but we’ve decided(well my daughter did) that we will be shallow and order fertilised eggs from hens that lay different coloured eggs. So now it’s just to wait for one of the hens to become broody. I paid a visit to Fotö where the 4 hens live that we sold before the fox came. So surreal, I think of them all gone, so to see Buffy, Vera, Captain Pugwash and Renee Biggs is like they’ve come back to life. They are very happy over there though! Sharing their home with the wild goose Gizmo. Gizmo was found as an egg(yes I know it’s illegal to pick eggs from wild birds but a kid found it and if they had put it back it would probably have been shunned). They hatched it in an egg hatcher and we saw him when he was just 2 days old, tiny fluffy thing with flippers. Now he’s huge! They are not friends but tolerate each other. Gizmo must like his home thought because his wings aren’t clipped and sometimes he’ll do a tour of the island but he always comes back. I am naturally very careful with closing the chickens in now after our fox visit, they usually head inside as soon as it starts getting dark but the last two nights that I’ve gone to close the hens in they have still been outside. Tonight I watched Lottie try to fly up in the cherry tree but she failed. She is definitely Esme reincarnated! I know that in a few weeks when it gets warmer I will have to climb that cherry tree every evening to collect her. Wouldn’t surprise me if she learns how to cockadoodeldoo as well as Esme did. I spent all day cleaning out Christmas and also because my husbands birthday happens to fall on the day Christmas is officially over(in Sweden anyways). Gosh I must say we are probably the messiest family I know but then it feels all the nicer when it’s done! I’m not the only one on the island being busy, all the youngsters on Hönö have their hands full. From day after xmas until Easter they are out, mainly boys between 7-25, looking for xmas trees. They ditch school, stay out all night and cycle around every nook and cranny on the islands(well the older one’s have Volvos). Last night I saw a light behind the barn, a car without the lights on and heard some noise so I thought I had to check it out. 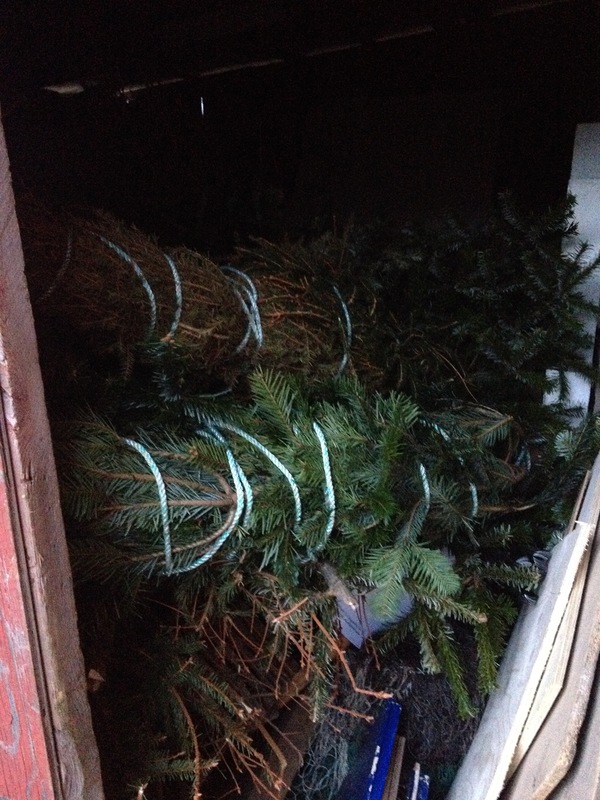 Of course it was xmas tree gatherers. I told them they are welcome to look around but please close all doors behind you. They were so friendly and helpful that something in the back of my head thought -hmmm maybe they weren’t looking but actually hiding? The next morning I had a look in “veboa”, a small shed behind the barn/gallery where I keep my wood, it was packed with trees! I’m really impressed with their technique, they’ve tied loads of trees together with ropes to fit in a small place. I told them that I would chuck out my tree Friday and they were very grateful. A lot of people think this tradition is a nuisance and should be stopped but I think it’s great. If you’re curious about where the trees end up read my earlier posts The big hunt is on! and You know you live on an Island when. It will be interesting got see how long they’ll stay in Veboa before another team finds them.